This front pulley offset spacer is ideal for V-Rod wide tire conversions and will allow you to mount a 280 or 300 tire on a 10.5 wide rim on the back of your custom V-Rod . 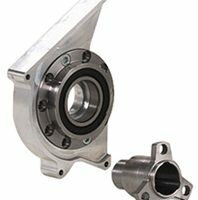 We recommend using a support bearing. 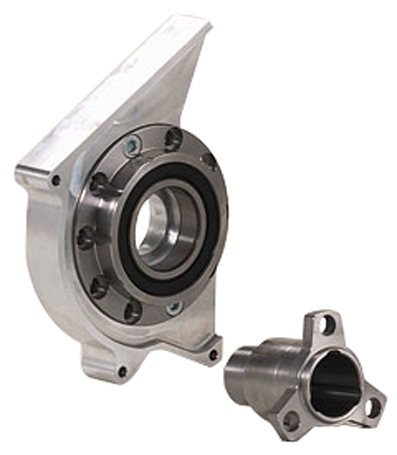 It provides additional support to the drive shaft with large-sized bearings, so that the shaft is not damaged. Please note with this kit the OEM front pulley must be re-used. 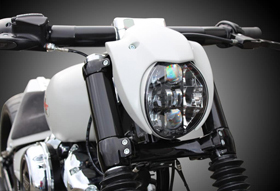 Available for all V-Rod and Street Rod models. Another question, are your pulley size 1 inchi or 1 1/8 inchi. Shipping would be to Singapore. Thank you for your interest in Eurocomponents’ front pulley offset spacer for V-Rod’s. 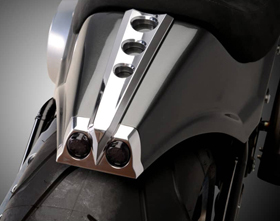 In order to install a 300 tire on your 2002 V-Rod you will need also a wider swingarm. You can either use a front pulley offset spacer which will let you reuse the stock Harley front pulley or our front offset pulley.